Annuals add seasonal color, perennials add substance, but trees add character to your landscape 'round the year. Flowering trees, in particular, have high aesthetic value. 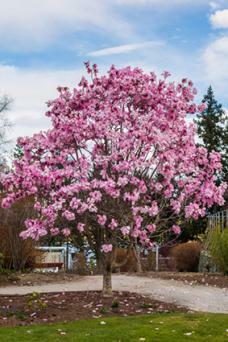 You might be able to find the right choice for your yard among these popular flowering trees. Beautiful dogwood trees (Cornus florida) come out with a profusion of flowers in early spring and continue the show for 4 to 6 weeks. Their fall foliage of deep red and purple is just as delightful. These Eastern United State natives naturally found at the edge of forests can grow 20 to 30 feet tall. Wherever space permits, their branches spread horizontally to form a large umbrella, so plant them where you can enjoy their natural shape. This tree is popular mainly due to this tiered horizontal branching. Their shape adds dimension to any landscape. The flower color of Dogwoods range from white to pink and red, but they all have four to six petals with a tiny notch at the tip of each one and yellow tuft in the center. The colorful petals are actually bracts, and the real flowers are crowded in the central tuft. 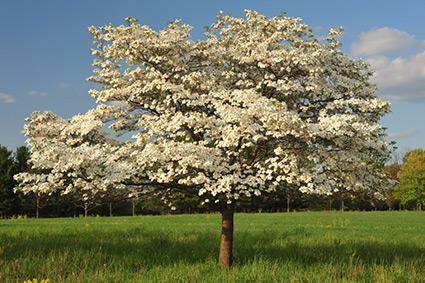 Flowering dogwoods thrive in USDA zones 5 to 9. The Asian native kousa dogwood (Cornus kousa) with pointed petals is hardier and resistant to the anthracnose fungus that kills many native flowering dogwoods. Unlike the American and European cherry trees grown for their edible fruit, flowering cherry trees (Prunus spp.) of Asian origin are cultivated for their beautiful flowers. They herald spring with a burst of pink and white flowers, thus putting them on this list amongst some of the most popular flowering trees. Another reason for their popularity is that this tree blooms very early before many other plants are showing their colors. Although the flowers on a given tree do not last for more than a week or two, staggered flowering by different trees extend the cherry blossom season. Flowering cherry trees are quick growing and can reach final height of 25 feet in about 10 to 12 years. 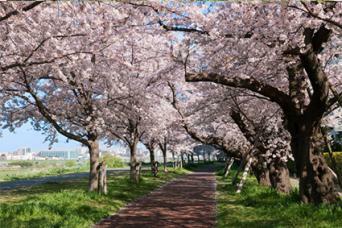 Cherry trees are naturally umbrella shaped with blossoms that have five petals. There different varieties and cultivars to choose from, some with drooping habit and fuller flowers. Almost all of them do well when planted in loamy soil and full sun in USDA zones 5 to 8, but Kwanzan cherry can be grown in zone 9. The stately Magnolia trees (Magnolia spp.) with large, fragrant flowers are a magnificent sight, especially when they stand alone. The flowers come in white, yellow, pink, purple, and red and open in early to late spring, usually before the leaves appear. Magnolias love rich, moist soil. They like their space and hate to be disturbed once planted. So choose the location carefully and prepare the soil well with slow-release fertilizers. Magnolias are popular because they have a beautiful shape that adds interest to any landscape, in addition to their highly aromatic flowers. Depending on your zone and availability of space, you can choose from the different types of magnolias. Evergreen Southern magnolias are suitable for the warmer climate of zones 7 to 9 while the large-flowered saucer magnolias that grow to 40 feet or more and the smaller star magnolias that do not grow over 15 feet are best for zones 4 to 8. Champaca magnolias can withstand heat and humidity in zones 10 to 12. Crab apples (Malus spp.) are popular for their beautiful spring flowers and equally attractive and delicious fruits in fall. In fact, they remain attractive the whole year with beautiful green leaf cover in spring and summer that turns to attractive fall colors with the ripening fruit. Crab apples belong to the same genus of apples cultivated for fruit and are sometimes grown in apple orchards for pollination. The flower color ranges from white and delicate pink to more vibrant shades of rose and deep pink. Single flowers carry five petals, but double flowered varieties abound. 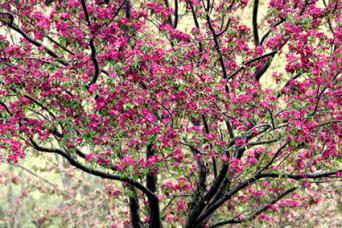 Some trees can grow as tall 40 feet, but most remain within 10 to 25 feet, so you can find a crab apple tree to suit even the smallest yard in USDA zones 4 to 8. Plant the tree in full sun, water weekly during drought, and feed occasionally. The ornamental Eastern redbud tree (Cercis canadensis) is a native of Eastern United States and Canada and usually has deep purplish pink flowers. White flowered redbud trees also do occur. The pea-like flowers appear all over the branches and on the trunk. This tree makes the popularity list mostly due to the fact that it blooms early in the season, so you can enjoy it's pretty golden yellow fall color before other trees have blossomed. The tree has a wide distribution across zones 4 to 9. It has small sized, colorful blooms that appear from spring to early summer, and the bright yellow fall foliage. 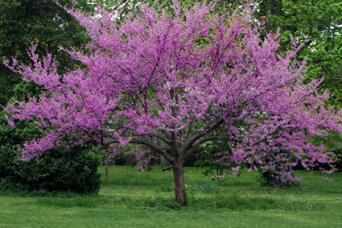 You can accommodate a redbud in any garden and keep it within bounds with regular pruning if required. It likes full sun, but can tolerate light shade. These fast growing trees, also called silk trees (Albizia julibrissin), with a tropical flavor are very attractive when they are covered with the powder puff, pink flowers. Popular for their quick growth, these trees are also loved because of their adaptability. They are cold hardy up to zone 6 and are drought tolerant to boot. However, they can be invasive in warmer areas such as zone 10. The flower petals are small and inconspicuous, so the flowers seem to be entirely made up of thin, long stamens that give them a very delicate look. The large compound leaves with tiny leaflets are as feathery as fern fronds. The flowers are mildly fragrant and attract hummingbirds. But the fallen flowers and fruit can mess up the yard and droplets of tree sap can damage paintwork. It is ideal if they are planted further away from the house. 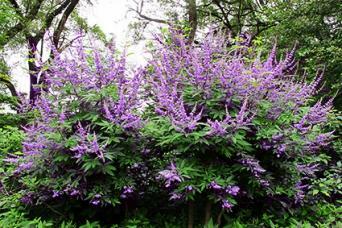 Chaste trees (Vitex agnus to castus) are valued for their ease of maintenance, making them a very popular tree amongst homeowners. They are drought tolerant and do well in poor soil in USDA hardiness zone 5 to 9. They grow 15 to 20 feet high, but the size can be controlled by pruning. They are known to die back in severe winters and grow back quickly. 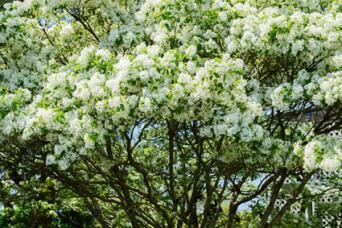 This tree has a long blooming period that stretches from late spring to early fall. The fragrant spikes that resemble lilacs come in white, pink, true blue, and lilac. They are followed by spicy, dark colored berries known as monk's pepper. 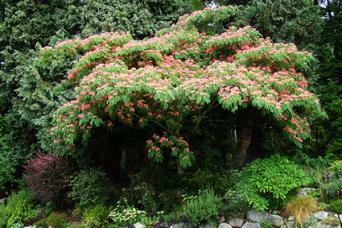 Grow chaste tree as a patio tree to enjoy the fragrant flowers all summer long. The fringe tree (Chionanthus virginicus) gets its name from the tassel-like flowers that appear in the mid to late spring. These small trees grow just 10 to 20 feet high in USDA hardiness zones 4 to 9. There are male and female fringe trees, the males being more floriferous while the female trees attract birds with the small fruits that follow their flowers. This American native with its fragrant white flowers deserves a place in gardens where its spring flowers and summer fruits can add interest. This tree is popular for its beauty but also for its adaptability as it can grow in both sun and shade, with its main need being moist soil. The North American native witch hazel tree (Hamamelis virginiana) is a multi-trunked tree that can grow up to 30 feet, but they are usually kept at 15 to 20 feet. It is popular as an ornamental tree because of its attractive foliage in the fall, along with its fragrant flowers. Full sun and moist, slightly acidic soil bring the best in witch hazels, but they are tolerant of shade. These hardy trees grow well in zones 3 to 9. The flowers that appear in fall are usually yellow and consist of four ribbon-like petals. If they emerge before the leaves are shed, they can be lost among the fall foliage of the same color. Plant them where you can enjoy the fragrant flowers. Crape myrtle (Lagerstroemia indica), also known as crepe myrtle or crapemyrtle, is a common landscape tree that produces bunches of delicate flowers in the height of summer. It usually grows as a multi-trunked tree 15 to 25 feet tall when left alone, but it is often fashioned into different shapes such as a formal single-trunked tree through selective pruning or an umbrella-shaped shrubby plant by topping. 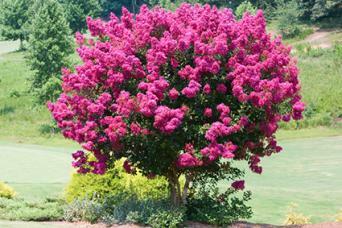 Popular because of their vibrantly colored flowers, crape myrtles are also easy to grow. Crape myrtles thrive in warmer areas in USDA zones 7 to 9, but these heat loving and drought tolerant trees are comfortable in zone 10 and above. The trunk is smooth with the bark peeling away in summer. The flower clusters borne on the tips of branches come in different shades of pink and purple or in white. 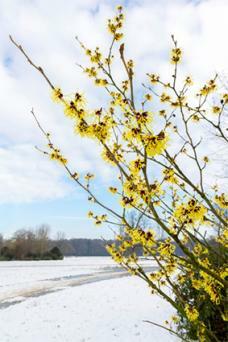 A late fall or winter pruning encourages flowering. Flowering trees add interest and beauty to your landscape and can be used as a focal point of interest. Choose a few trees that are suitable for your growing zone and garden space. Be sure to put your trees where you can enjoy them from both inside and your outdoor living spaces.